I have always had a nagging suspicion that young farmers are a creative, innovative, and poetic lot of individuals. We have degrees in art appreciation, environmental science, and anthropology. We design chicken tractors and refabricate old washing machines into spinners for salad greens. We use words like “permaculture” and “reemay,” eat big salads, and talk with our hands. Even so, I never would have thought our young minds could attach wheels to a farm and make it drive. Then Compass Green Project rolled into view. The Compass Green Project took one year to materialize from a brilliant light-bulb idea into a greenhouse puttering around in a truck. The star of the show, the truck, was purchased in March of 2011 from a woman who had used it as a mobile art gallery in New York City. The truck wasn’t cheap, and, after securing the first payments with milk money and personal risk, the fundraising began. 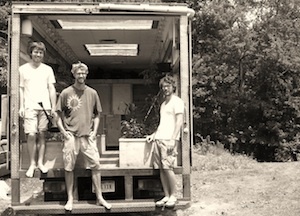 It took about one month for Compass Green to secure (via a fundraising website, Kickstarter) the start-up capital necessary to convert their truck into what it is today. There were garden boxes to be built, storage cabinets to be stacked, a cab to be cleaned, and veggie oil to be collected. Enter Dr. Dave from Ashville, North Carolina, who knows a thing or two about diesel engines and spent fryer oil. Justin and Nick rushed their little truck south with dreams of fuel conversion. What was expected to be a four- or five-day conversion process ended up taking two weeks because, as it turns out, no one had yet converted a truck like this one to run on vegetable oil. 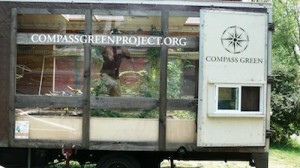 Two months later the Compass Green Project rolled into my humble town of New Paltz, New York. Referral after referral takes them to new towns to teach more people about sustainable agriculture. They teach classes about companion planting, rain water catchments, deep soil preparations, and hexagonal spacing instead of rows. They teach children what a tomato needs to survive, and teach adults how to help their kids love tomatoes. 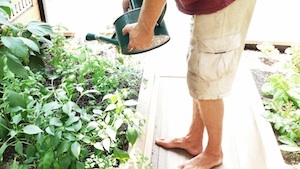 They teach how to grow intelligently on a balcony, an acre, a campus garden, or a truck. And when they are through teaching, they eat what they preach by harvesting their crop and sharing a meal with other farmers along the way. We at Tweefontein were lucky enough to be some of those farmers, and I got a chance to ask them for a little advice, young’un to young’un. After a thoughtful moment and a couple bites of zucchini, they concluded that it is most important to simply do something, especially if you are passionate about it. They said to stay intelligent and just start running with your idea. They observed that we–young farmers–are farming in a new way. One has to take that first plunge, and to trust that doing something you love will make it easier to be creative. I am certain that these gents love what they are doing, and their creativity appears boundless. They have impressive goals for their humble truck, and are spreading their knowledge one town at a time. They are off to Vermont, Connecticut, Maine, and then the Midwest. So if you want to catch these visionaries in action, it would behoove you to contact them via email. I like to think of them as the Fantastic Three of sustainable agriculture: If there are people to teach, they will be there. If there is a plant to be planted, they will do it. If the agricultural revolution needs more people to initiate growth for the country, consider them at the forefront. This recipe was created by the men of Compass Green Project. Careful–you never know which leaf will pack that mustard green spice! Put one walnut and two cranberries in each leaf of mustard green. Serve on a platter. To enjoy, wrap the mustard green around the walnut and cranberries and take a bite. Allow hilarity to ensue as you guess whose treat will be spicy. « previous article: New Internships at NYFC!